I've been receiving numerous kits lately of German, late-war, experimental vehicles. Unfortunately. I have no reference material for most of these, so all I can do is show the kit to you, and let you make your own comclusions. This set is only the five parts shown above, all of which are perfectly sculpted and cast. There is a single tiny air bubble on the edge of the turret, but other than that, there are no casting flaws that I can find. Although the crew hatch is molded closed, being on such a flat, smooth surface, it should be quite easy to replicate a new hatch, and open it up. 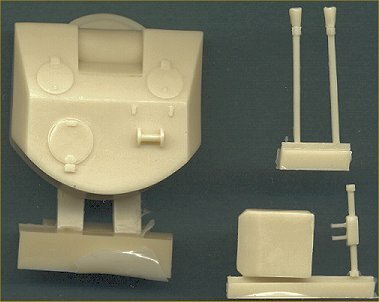 This set is intended to convert any Panther kit, and the turret ring is small enough that it should fit into any kit currently on the market. Thank You very much to Coelian Models for sending in the review sample.